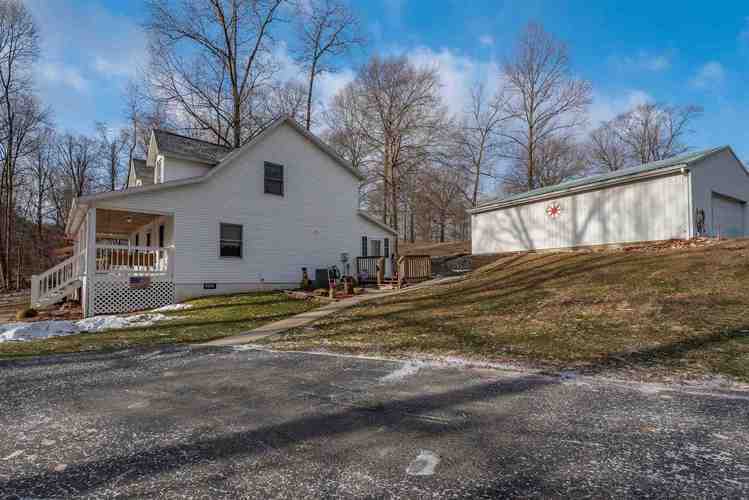 You will not want to miss this 1.5 story home on over 3.6 acres with a beautiful wooded view. You get the best of both worlds here with the beautiful country setting and only 5 minutes to west side shopping and restaurants. This home has 3 bedrooms and 2 full baths, was built in 1996 and has over 1,900 sq. ft. There is a bedroom on the main level with two more on the upper level. The kitchen is equipped with all appliances and granite counter tops. The laundry room is on the main level and the washer and dryer are included in the sale. The master bath has been newly remodeled and beautiful barn doors have been added for that perfect touch. You can sit on the covered front porch or in the enclosed back porch and enjoy the beautiful nature view. And that's not all....there is a 1200 sq. ft. (30 x 40) pole barn with garage door openers to store all of your lawn equipment, toys, and more. The home owners are offering a HSA home warranty as well. All of this is being offered at only $249,000.00 so schedule your viewing appointment soon as this will not last long! Directions:West on St. Rd. 48 to left on Cave Rd. then right on Holland Hill Lane. House will be on the left. Listing provided courtesy of Century 21 Scheetz - Bloomington.